Yorkshire Terrier, or “Yorkie” puppies, are irresistibly cute and have the ability to melt your heart into a million tiny pieces. 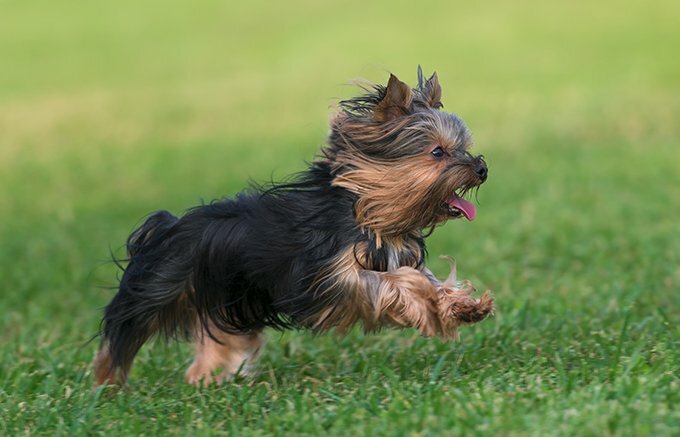 Before you run out to your local Yorkshire Terrier rescue group to bring this adorable pup into your life, there are a few things to know about the breed. Check out the adorable Yorkie puppy pictures below and keep reading to find out if you’re ready to adopt a Yorkshire Terrier puppy! Here are some facts about Yorkie puppies! This isn’t to scare you right off the bat, but Yorkies are a bit notorious for their bladders. The tiny pups are the kings and queens of not wanting to be too wet, too cold, or too hot, so they aren’t exactly keen on going outside to use the restroom. Arm yourself with puppy pads, housebreaking tips, and a lot of patience. Yorkies are potty-trainable, they just like to do it on their terms. An outdoor potty zone that is covered may help in this situation. A puppy jacket may also help if your Yorkie doesn’t like to go out in the cold. 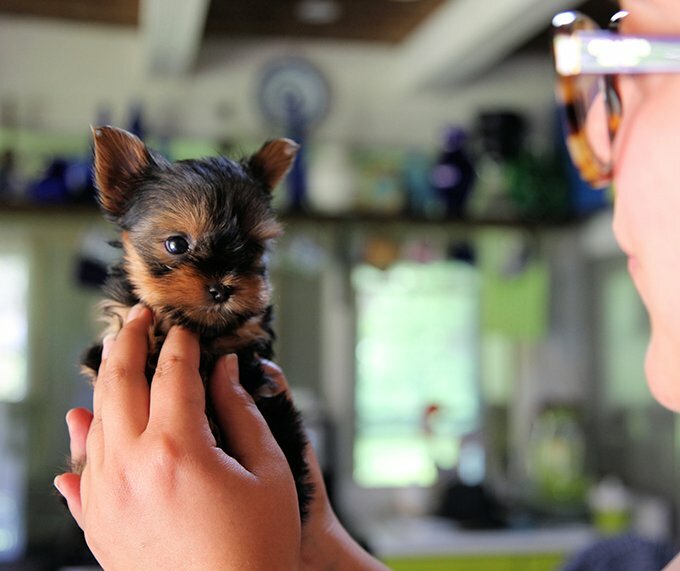 How can you look at a Yorkie Puppy and NOT want to hug ‘em and squeeze ‘em? They are just so stinkin’ adorable and tiny. Because of their small stature as puppies, they are very fragile. 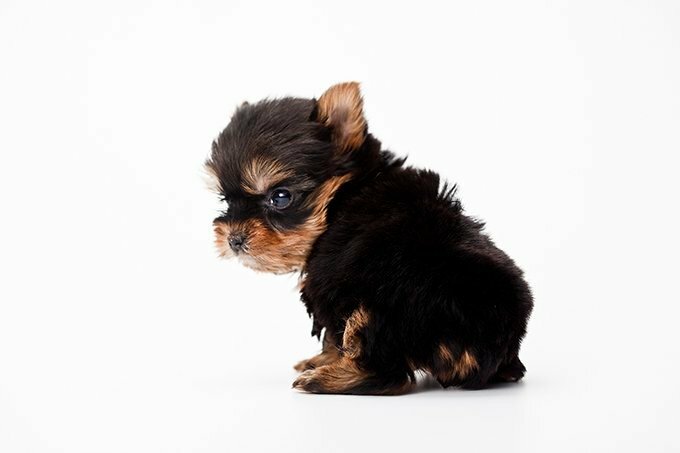 Excessive handling by small children or an accidental unwatched step can be life-threatening to a Yorkie puppy. If you want to bring a Yorkie baby into your home that also has human children, be sure to have a lengthy discussion on how to play with your puppy without injuring them. Napoleon Complexes don’t just exist in humans; Yorkies have them, too. Convinced they are much bigger than they actually are, Yorkieshire Terriers will yap and investigate any larger dogs, cars, or other curiosity-inducing objects, like your bike haphazardly leaning against the wall. 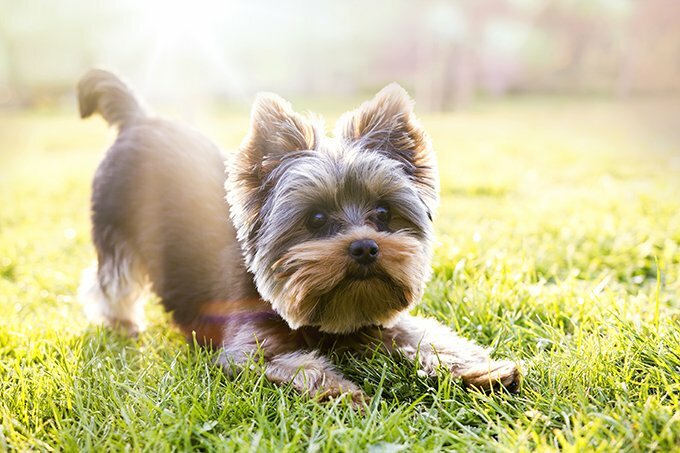 To safeguard your Yorkie puppy from trouble, they should always be kept on a leash while walking and a close eye should be kept if they are doing their business in the backyard. Their larger-than-life attitude goes for playtime as well. Originally bred for rat-hunting, these pups are curious, fast on their feet, and love a good ball–or toy rat–chase. Despite their luxurious, flowing locks, fur clean up is not a huge issue with Yorkie puppies. Yorkies actually have a single layer of fine hair, not fur, that will shed very much like a human’s. They may naturally lose a few strands when being groomed or pet, but they will not start to form literal hair balls that find their way under your couch. The hair will also continue to grow until you get it cut, hence show Yorkshire Terriers having floor-length coats. This special coat also makes them a better option for people who suffer from allergies. Yorkshire Terriers are a bit infamous for yapping, but they tend to make other goofy noises, too. They are especially prone to pharyngeal gag reflex, or reverse sneezing. This sounds like the dog is gasping for air and making a honking noise at the same time. It can be a little alarming to witness, but they ultimately pass after a few minutes. Yorkshire puppies are also pretty vocal and will let you know any time something is up with a whine, yip, or yap. Also, please remember that you can find any breed of dog you are looking for at your local shelter or with breed specific rescue groups. Do you have a Yorkie at home? What would you recommend for someone looking to adopt a Yorkshire Terrier puppy? Let us know in the comments below!